Ultimo College Sydney and Innotech are proud to announce the first ever "Student Achievement Award" for the Industry accredited HVAC & BMS Controls Course. From left to right: Ultimo Teacher Miroslav Capko, Walter Colaiaco Innotech Systems Trainer, Award winner Chris Burrell, Senior Head Teacher for the Refrigeration and Air Conditioning section at Ultimo, Greg Riach. This has been provided to a particular student who has demonstrated a high level of understanding, and has gone above and beyond class requirements while participating in the industry controls course that is now offered at many institutes globally. This nomination was directed by a teacher at Ultimo College to an individual who they feel has shown a high level of participation and outcomes above the regular course requirements. Ultimo College is located in one of Sydney's strongest education, cultural and entertainment precincts. 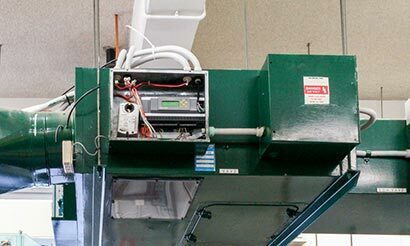 Senior head teacher for the Refrigeration and Air Conditioning section, Greg Riach, has committed to making the Innotech developed HVAC & BMS industry controls course the best in the region. 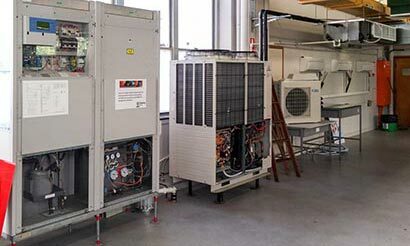 The controls course at Ultimo is delivered by teacher Miroslav Capko who has many years of BMS and HVAC experience. 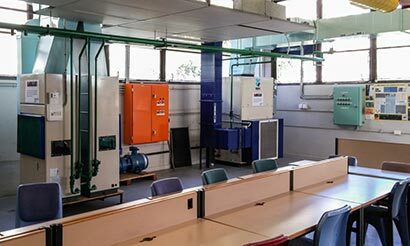 Above: The HVAC plant and DDC’s at Ultimo College that Chris programmed and commissioned in addition to the class workshops. In April 2015 Miroslav delivered a class to a group of Navy students. During this class Miroslav quickly identified student Chris Burrell as one who excelled in programming the controllers. Chris also showed an active interest in the theory content during the training. We suggested Chris for the award as he went above and beyond the requirements for the controls program that we were running and he was fully committed to the project at hand. During an introduction to DDC he excelled and did a lot more than what was expected, and he continued to display an advanced level of understanding of DDC processes. At practical projects in the workshop Chris took ownership and worked on the software, compared other configs, and modified and uploaded the files to the controllers with minimal guidance from me. During the whole process he was self-motivated and excited about the progress of the project and continued to develop his understanding of DDC systems. When Miroslav contacted me in relation to the nomination, I was excited to hear the feedback and I believed Chris deserved recognition for his efforts. 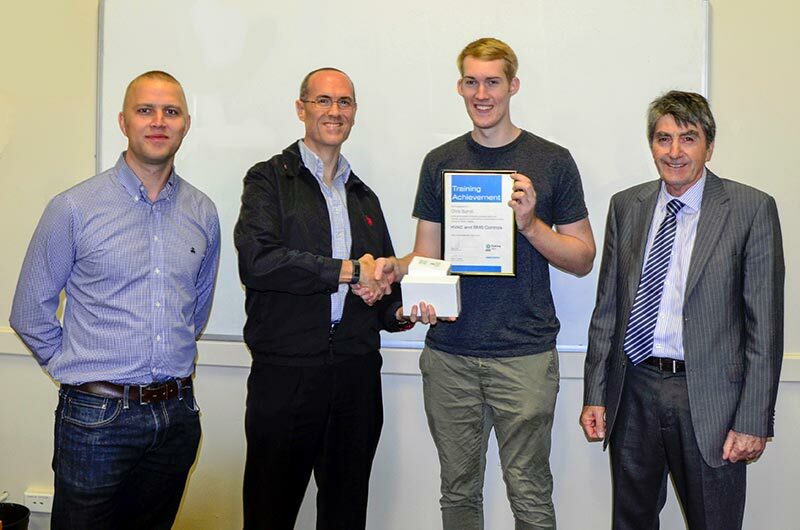 With the backing of the Innotech Directors I was able to provide Chris with his own MAXIM II DDC and USB converter as part of an award so he can continue with his studies and development. Innotech is passionate about increasing skills within our industry, and supporting those who show an interest in gaining knowledge in the HVAC & BMS sector. During a planned visit to Sydney I was able to meet up with the Ultimo teachers and Chris, to hand him his award in person, and also to ask Chris a few questions in relation to the course he had completed. Chris participated in the training session within a group of Navy students. During our conversation he discussed the passion he has for programming and how excited he was to get involved with the training. He wanted to see what else he could learn and how far he could take his knowledge and skills. He enjoyed the training session immensely and was excited to watch his programming make the plant equipment come to life. He said the practical nature of the course really reinforced all the new theory he had learnt. Chris also advised that the course would be of great benefit to anyone looking to become involved in the programmable control world, as he commented that there is no limit to the amount of skills and knowledge that you can learn. Chris highly recommends the controls course and is looking forward to us developing the next level to further enhance his skills. He was very appreciative of the equipment and support that Innotech had provided and he was keen to have a play with them. We are sure Chris will make good use of his new MAXIM II Direct Digital Controller. Innotech is proud of Chris’s achievement and we are sure that he will take his new found skills and apply them in his future work practices within the industry. We are also happy to be part of the Ultimo College vision to provide the best possible training experience to all participating students in the years ahead. Well done and congratulations to Chris Burrell and Ultimo College on this achievement.